"Pyramid-Hotel" has been welcoming guests from all over the world since 1993. It is located in the very centre of the city near the sea, close to the sea terminal and railway station. 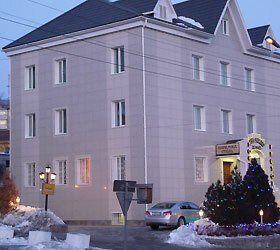 The hotel si convenient for business and tourist trips to the Far East of Russia. Municipal Exhibition Centre is situated near the hotel. The hotel has Suite, Junior Suite (with double bed or twin beds) and Standard rooms. Each room is fitted with - air conditioner, fridge with mini bar, safety box for storing valuables, satellite TV, long-distance and international satellite communication, high-speed ADSL Internet access and free Wi-Fi Internet, hair dryer, toiletry accessories. Hotel's restaurant, seating 35 guests, is designed in Venetian style. The menu offers courses of European, signature and fusion cuisine - seafood and meat dishes, classical and original desserts, elite spirits of leading brands, flavorful tea and coffee, freshes and a big selection of cigars. The restaurant is well prepared for hosting festivities, banquettes, corporate events, wedding receptions and birthday parties. Caring and attentive hotel staff will provide any support information, including airline and train schedule. Hotel services include - taxi call, fax messaging, photocopying, Internet access. Order is ensured by reliable security agency. Driving guests can park their vehicles at the secured parking.